One of Washington D.C.’s most charming colonial-style neighborhoods, Old Town Alexandria remains a favorite location for engagement photography. Start off your photo shoot at The Athenaeum building, located in the heart of Old Town Alexandria. Have your engagement photographer arrange a portrait of you and your fiancée beside one of the structure’s towering Greek columns or in front of the elegant wooden entrance doors. You and your fiancée can also take photos seated on the building’s front steps, using the gorgeous Italianate-style architecture as a backdrop. Once you’ve finished at The Athenaeum, head over to the George Washington National Masonic Monument, located only a mile away. The stunning classical style of the structure makes it one of Alexandria’s most popular sites for engagement photography. Begin with some relaxed photos on the lush green grass in front of the monument, or beneath the blossoming cherry blossom trees. The steps leading up to the monument are a perfect place to pose for a private portrait. Finally, have your photographer use the Doric-style entrance as a background for an elegant finishing touch to your photo shoot at the monument. Your last stop in Old Town Alexandria will be the seaport area, which borders the East Potomac River. This section of the neighborhood offers a myriad of stylish boutiques, as well as a preserved ambience reminiscent of the Colonial era. Your engagement photographer can take photos of you and your fiancée as you take a leisurely stroll Union Street and explore your beautiful historic surroundings. Head out toward the harbor and have your photographer capture a portrait with the glimmering Potomac in the background. You’ll always remember your engagement photography session in historic Alexandria! If you’re looking for a vibrant outdoor setting for your engagement photography session, Washington D.C.’s Bartholdi Park and East Potomac Park are the perfect locations. Begin your photo shoot at Bartholdi Park, located in the southeastern corner of the National Mall. Intricately landscaped, this park contains carefully-arranged flower beds that will add bursts of color to your engagement photos. You and your fiancée can also pose beside the famous Bartholdi Fountain, which commands attention in the center of the park. The fountain and its sparkling surrounding pool will provide a great backdrop for a portrait of you and your man. There are also plenty of stones to use for seated photos. Located south of the Jefferson Memorial and the 14th Street Bridge, East Potomac Park is a popular photography location that runs along the Potomac River. You and your fiancée can walk along the waterfront as your engagement photographer takes some candid photos, with the ripples of the Potomac River in the background. Feel free to frolic in the verdant grass or kick back on the wooden benches scattered throughout the park. East Potomac Park also offers seemingly endless clusters of rosy cherry blossom trees that will add a vivid, colorful touch to your engagement photo album. Have a blast exploring two of Washington D.C.’s most popular parks! Located in the northwestern part of Washington, D.C. along the Potomac River waterfront, the affluent and historic Georgetown neighborhood offers numerous landmarks for your engagement photography session. Start off your photo shoot at the Georgetown section of the Chesapeake and Ohio Canal, located between K and M streets. Completed in 1850, the canal is essentially obsolete now and mainly serves as a popular tourist attraction. You and your fiancée can pose on one of the miniature bridges that over look the tranquil canal as your engagement photographer goes to work. You can also walk over to the Washington Harbour complex on K Street, which is a great spot from which to view boat races. Combined with the area’s charming outdoor bars and boutiques, the Georgetown section of the Chesapeake & Ohio canal makes a fun place for your engagement photo shoot. Only a few miles away you’ll find Rock Creek Park, which is often described as the Central Park of Washington D.C., but is twice as large. Rock Creek, the area that gives the park its namesake, has a wooden bridge that overlooks scattered stones of all sizes and a gurgling creek flowing through the crevices. In the fall and summer seasons, the trees that surround the creek display vibrant foliage that will greatly enhance the setting for your engagement photos. For the adventurous couple, the park also provides many scenic paths and trails to explore. 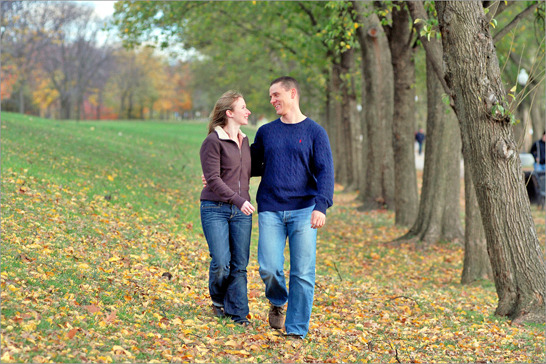 Finish off your engagement photo shoot in Rock Creek Park at the Battleground National Cemetery, which contains an immaculate chapel where you and your fiancée can pose for some private photos. You’ll never forget your exciting engagement photography session in Washington, D.C.!